Left: Depositional Environment II, 6 ft. x 4 ft. algae, water, wood, acrylic, stairwell skylight. Center: foreground: Depositional Environment I, 18 ft. x 8 ft., algae, water, wood, acrylic, central gallery skylight; wall left to right: Landscape Projection (for an Unknown Window) No. 10, 6 and 7, 9 ft. x 6 ft., b&w photograph. Right: Depositional Environment I; wall: Landscape Projection (for an Unknown Window) No. 9 and 6. The exhibition Original Depositional Environment at Gallery Paule Anglim in San Francisco, CA. is predicated on the concept that much of architecture is a special mineral-lithologic assemblage, a geologic formation created by humans. In the example of Gallery Paule Anglim, the building is clad in fired sedimentary clay brick cemented together by cement and sand derived from limestone, the internal structure of steel is refined iron ore and the ‘sheetrock’ internal wall coverings are a form of the mineral gypsum. The idea of human-based geology can be generalized with the term "anthroturbation," meaning "human-disturbed." In the 1999 essay, describing the work, Holocene Terrace, this concept was elaborated on further: This term describes the disturbance, dislocation and restructuring of geologic formations and materials by human agencies into new forms. These processes have analogies in the natural world, such as: mining as erosion, transport as flow and construction as sedimentation. Likewise, the built topography of a city can be understood in geomorphic terms: streets as canyons, buildings as plateaus, sewers as caves and plazas as playas. Central to Original Depositional Environment’s concept are the installations, Depositional Environment I and II. 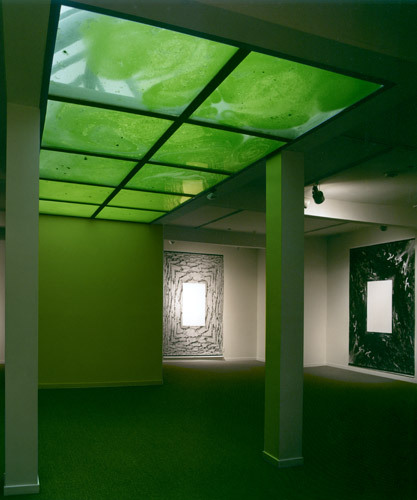 These are transparent, water-filled constructions containing living algae inserted into its skylight wells of the gallery. The algae and water are used as signifiers for primal marine, estuarine, fluvial and paleo-climactic environments of the geologic past and the process of deposition of silts, sand and other materials collecting in these conditions that would later be lithified into slate, sandstone or shale. 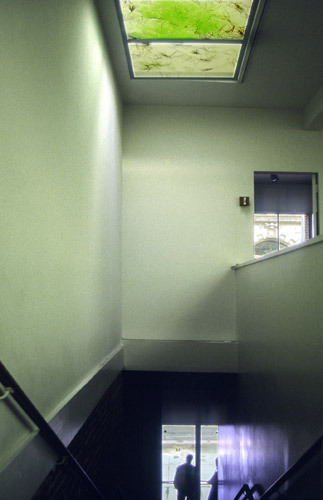 As in the project, Holocene Terrace, installed in a Manhattan gallery in 1999, which used moss in a similar manner, the botanical material’s visual presence and vitality are dependent upon external conditions such as sunlight, rain or temperature, the current "depositional environment." 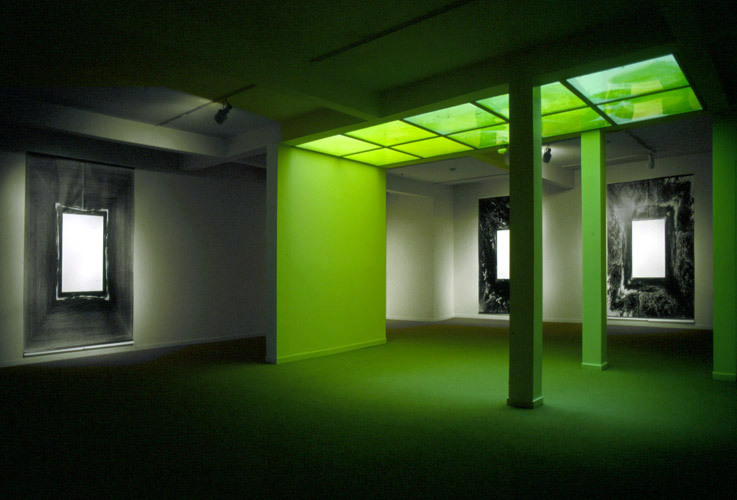 Completing the exhibition are five digitally augmented photographs of landscape imagery wrapping a central window/void from the Landscape Projections (for an Unknown Window) series, 1998-2001, installed on the gallery walls subtly receiving algae influenced illumination and further echoing the theoretical reference of architecture to natural systems.